I’m in a food rut. Which actually seems funny because between Sharathons and our busy schedules I’ve only been cooking 1-2 times a week for the last 2 months! All that will change when our “normal” routines kick back in on November 12th. Still, I needed something new and different preferably with ingredients I had on hand. 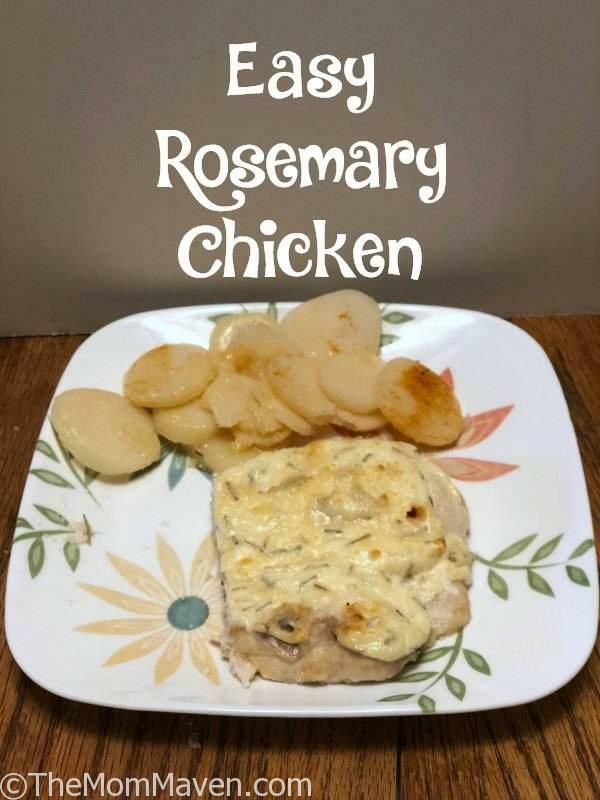 I’d had rosemary on my mind for days so I created this easy rosemary chicken recipe with just 5 kitchen staples. 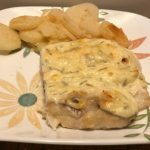 I served this dish with new potatoes and veggies. Yes, I realized when I was editing the photos that I took them before there were veggies on the plate…Oh well. I'd had rosemary on my mind for days so I created this easy rosemary chicken recipe with just 5 kitchen staples. Preheat oven to 375°. Spray non-stick spray on a 9x13" baking pan. Pound chicken breasts down so that they are similar in thickness. Place the chicken into the baking pan. In a medium bowl, mix together the sour cream, rosemary, pepper, and 1 cup of the Parmesan. Spread the sour cream mixture over the chicken breasts. Sprinkle the remaining 3/4 cup of Parmesan on top of the chicken. Bake for 25-30 minutes, until chicken is cooked through and juices run clear. Change the oven to broil and broil for 2-3 minutes until cheese on top is lightly browned. This recipe scales easily, I cut it in half to feed the 2 of us and it was perfect. Ron isn’t a huge sour cream fan, so I didn’t tell him there was sour cream in this recipe until after he ate it, and enjoyed it. He wants it to go in our regular meal plan rotation. I hope you enjoy this recipe and all of the easy recipes I share here on The Mom Maven. I hope you share them on your social networks. I just ask that you not copy and share the entire recipe with photos. Please use the sharing buttons below and share the link to this post. Thanks!